Give yourself 25 extra credit points if you looked at the picture above and said to yourself (or out loud), "Hey that ain't the chassis that came with the Li'l Red Express kit!" 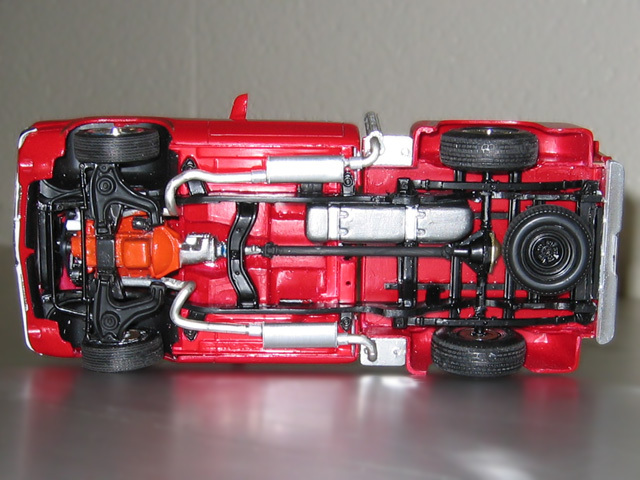 Zoli swapped in a Revell Dodge Ram VTS chassis and suspension. He says the chassis simply dropped into place. To connect the Hemi exhaust manifolds with the truck's exhaust stacks, Zoli routed custom bent solder pipes through the VTS chassis. After adding big and little tires to the Superbird wheels, Zoli scratchbuilt the rear bumper and fitted a modified Coronet taillight panel between it and the tailgate.